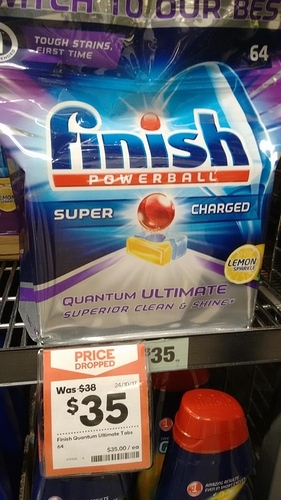 Woolies still struggles with unit pricing. Interestingly, all the other Finish Powerball products WW website search for Finish Powerball Quantum are priced per ball, EXCEPT this one. It is noteworth that five of the products are cheaper unit pricing wise than this large packet (at $0.55). I noticed the same thing on the Coles website just a few days ago. I was looking at floss, and half of the products were per pack and the other half were per metre. It’s a bit silly, honestly. So it seems to me that Coles may be contravening the legislation. Unit pricing of coffee capsules per weight vs per item. Unit pricing of tea bags per weight vs per bag. The last one is interesting, a 935g container measured per 100g for unit pricing vs a 700g container measured per kilogram for unit pricing. This stuff doesn’t ‘just happen’ - the labels are printing exactly as the code is written - decisions are made, the label printing code just ‘does its job’. And this wasn’t a ‘serious look’. I was just doing my shopping, and noticed these. I’m sure if an audit was done, there would be heaps more. Numerous times I’ve seen staff walking around with reams of printed pricing labels that they have to place into the correct spot. This leads me to think that the pricing is ordained from ‘on high’, which confirms what you said about failure of specifications, coding and back end. Hi all! As many of you would know, unit pricing can be a useful tool to save you money. But it isn’t perfect. Supermarkets try to make it difficult for us, they use small text, don’t display information correctly or don’t display the unit price at all! With the government due to review unit pricing soon, we’re looking for volunteers to help us find examples of supermarkets using unit pricing incorrectly or not at all. Can you help us crowdsource examples of bad unit pricing? Keep an eye out in the shops for common unit pricing issues like too-small text, and pricing that’s not displayed, incorrect or obscured. Get your phone or camera out, snap a pic and send it through to campaigns@choice.com.au. Once we’ve got enough photos, we’ll compile all the problems in a report to take to decision-makers. Any questions, please let us know. Thank you!! I wonder if there are any people from our @Consumer-Campaigner group willing to help out? Went to Coles yesterday and didn’t see anything out of the ordinary. Some weeks it’s one mistake after another. Thanks Katinka. This is a great and very welcome initiative from Choice. I encourage Community members to sign up and send in photos of bad unit pricing not only for food and grocery items displayed in shops but also at online selling sites and in printed catalogues, adverts etc. all of which are covered by the mandatory Unit Pricing Code of Conduct administered by the ACCC. First glance, the one on the left looks cheaper until one realises that different measurement units are used for similar products on sale (and are actually the same unit price). Why a standard unit of measurement is not used store/nationwide, is anyone’s guess. Why not use $/kilogram for those products sold by weight (or which has a weight on the packaging) and $/number for those sold by the number in packets (and no weight shown on the packaging). This is a really good example of issues with unit pricing @phb. We are finding that different units of measurement are a common issue. Thanks so much for sharing! Share your unit pricing problems! In a local independent grocer, a carton of dozen eggs the unit price was $/dozen. Next to it was a carton containing 10 which was $/egg. If I remember to take the camera next time I pass it, will take a photo if it is still displayed the same. Toilet paper also has inconsistencies, either $/roll, $/100 sheets or other varying units. Actually a lot of the issue may stem from the stock keeping aspect. The labelling just grabs its data from that, so the item could be put into a group that it doesn’t belong have a slightly different category, have been moved about or just flat entered incorrectly. single can of soda … six pack … 10 pack … 12 pack (20,24,30 etc etc). that grouping works for cans of soda but cans of veg might have a different set. different suppliers probably provide different info in different ways and then totally different people enter and update that info in the system too. may stem from the stock keeping aspect. […] different suppliers probably provide different info in different ways and then totally different people enter and update that info in the system too. Which is exactly my point - it doesn’t ‘just happen’ - what we are seeing on the shelves is the direct result of choices that are being made, coordination, planning, communication (or by omission of any combination of same) but all choices none the less - what we are seeing is essentially the presentation layer, and how many muppets there are supporting what we see isn’t entirely clear, but there’s a few layers for sure (or to borrow from the problem of infinite regress, “it’s muppets all the way down”). I have a smidgen of experience in the field which tells me none of the problems we are seeing in the retail outlet are insurmountable and in reality none of them are even particularly difficult to address - well, if it’s ‘planned’ that way, of course remediation post muppet-fest might be a little more difficult, and thats where the big stick approach is helpful. I have a smidgen of experience in the field which tells me none of the problems we are seeing in the retail outlet are insurmountable and in reality none of them are even particularly difficult to address - well, if it’s ‘planned’ that way, of course remediation post muppet-fest might be a little more difficult, and thats where the big stick approach is helpful. I used to program POS systems (was in charge of labelling reporting and apps among others), don’t have to be a muppet for issue’s to occur as its quite complex and its worth noting they mostly get it correct atm. does the same issue occur in each store or is it store specific (which goes to program issue vs how a store’s staff is using the program) is it a data issue at store or company level (or both), is it a supplier sending them dodgy data. WW/Coles they are their own wholesalers and logistics companies too and the sheer volume of products as well means overall error %'s very low. It bugs me every time I see it happen as again I used to program these things, and I’m very keen to see what the choice campaign comes up with etc! Here is a snip from a few I sent in. From Woolies online.